It means that they're incredibly desperate. For a corporation that makes as much money as Coca-Cola does in selling sugar water to admit, however indirectly, that drinking a great deal of sugar water might affect weight, is clearly a Hail Mary pass. I've blogged before about the writing on the wall for big beverage - but this definitely takes the proverbial cake. Sadly though, I'd bet it succeeds in its two main aims. Firstly it will further reinforce the erroneous belief that you can out train a bad diet. Secondly it will provide Coca-Cola ammunition with which to fight industry unfriendly legislation by suggesting it's working hard to be part of the solution. 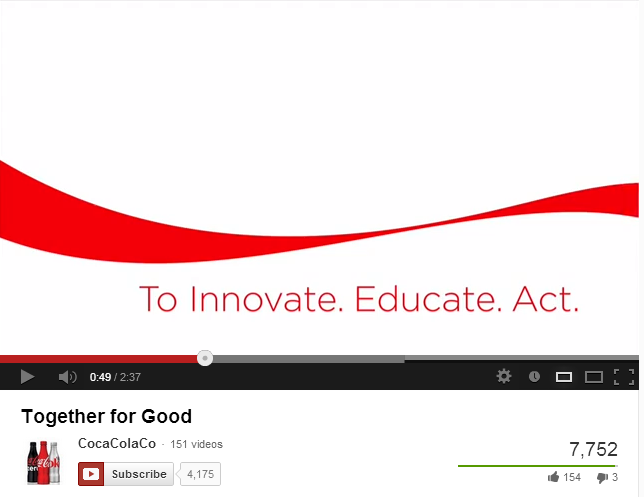 Coca-Cola's job is to sell products. As many as they possibly can. That's it, that's all, and there's nothing wrong with that - it's the way our society is built. The aim of this advertisement is to do just that because soda taxes or policies that restrict sales will be far worse for business than an ad designed to deceive the public into believing that Coca-Cola's part of the solution and that you can out run your glassful of sugar. Writing's clearly on the wall. Now just a matter of time. We just need to keep up the pressure.